If you’re like me, you may be seeing Gabby Giffords’s face on nearly advertising-supported website asking for money to fund her PAC. We can also find Joe Scarborough calling on the president to covertly work with a billionaire to buy local elections where the little people don’t vote the way the elites think they should. Then there’s the Brady Campaign telling a political outlet that they will start using their PAC to get involved in elections. One of these sentences is not like the other. If you guessed it was the Brady Campaign turning into a campaign operation, give yourself a pat on the back and maybe a Snickers bar for good measure. On the senators who voted against the bill, Brady Campaign President Dan Gross told PI: “We’re watching them and we’re holding them accountable.” He added, “We’re flooding calls from the American public into their offices.” Brady said the group would look at using its PAC against members of Congress who voted against yesterday’s pro-gun-control amendment. “We are definitely going to be looking at what we can do on an electoral level,” Gross said. Well, Dan, let’s help you look at what you can do on an electoral level based on the most recent data you filed with the .gov. 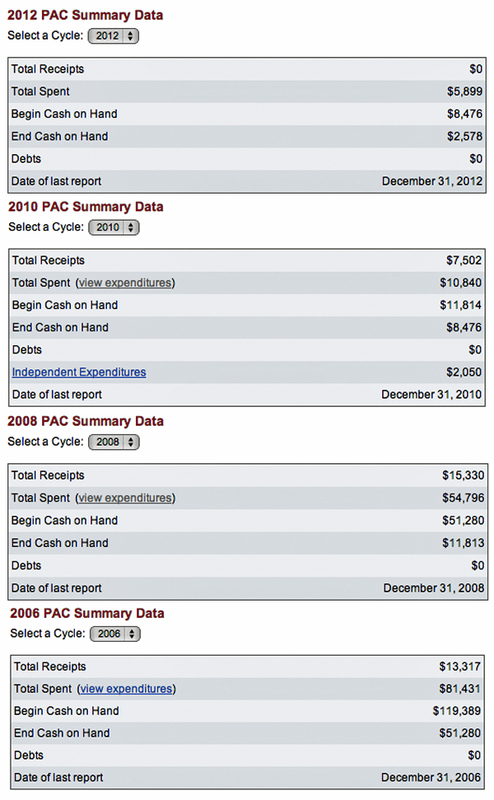 Even after Newtown and knowing they would likely need to launch an electoral fight, the Brady Campaign raised a big fat nothing for their PAC in all of 2012. Either Dan Gross is lying to the media about his intentions or he’s grossly incompetent in understanding that their current cash on hand in the PAC isn’t even enough to make one maxed out donation and pay all of the fees they appear to have in maintaining the account annually. Now, I realize that they may be able to raise money for the PAC this year, so we’ll keep an eye on it. Regardless, I feel like Politico left out key context to the story of their potential involvement by deliberately ignoring the fact that they have raised less than $37k since 2006 (when Paul Helmke took over) and raised absolutely no PAC dollars under the current leadership. You can go from nothing to something in less time than it takes to read this post. I am not talking about Bloomberg-sized donors. All it takes is smart management and a willingness to execute. Some of the nations formerly small-operation state groups have grown up big time. They did this fast – usually through demonstration that they can execute what they talk about. In other words: leadership team. That’s the issue for Brady – execution and management. They got a good brand name – everyone knows their name and what they stand for. Their problem is a lack of execution and an unwillingness to put forth a leadership team who do good for the organization. Ever since previous management walked (or was ‘walked’), they’ve gone downhill. But nothing is forever. A new team and a renewed vision and their brand will take off. They could be thought leaders again. You are probably the most clued in public blogger in the nation on this issue. Let’s not get lulled into complacency again (and I include myself on the list of past guilty offenders). Brady may be quiet now, but like any flammable material it only needs the right spark to explode. They got the brand. All they need is the leadership. I agree that it is possible for them to raise money quickly. They did do that right after Newtown, but only for their (c)3 and (c)4. (I think mainly for the (c)3 at that, but we’ll have to wait for records in future years to know for sure.) Raising zero dollars in 2012 means they didn’t even put out an email appeal for a few bucks for the PAC before or after Newtown. They were clearly ready to let the PAC completely close out with the numbers they were posting. This indicates that regardless of what they are telling the press, their strategy is largely remaining the same. I do plan to post more about money in the issue on their side. I was looking back at previous cycles and was reminded of some other big splurges on this issue. I’m not encouraging people to get complacent at all because Bloomberg is willing to spend where the Brady Campaign is completely incompetent. Heck no. You are not complacent – you are the tip of the internet spear. I think the point I was making in that regard was that some might take comfort from the small numbers, only to be surprised later. I think the issue with Brady is over exposure with an ‘incomplete’ on execution. They really have become the people who taunt, rather than a group who can get anything done. Granted, they had a hard ride against us. But no reason MAIG should outpace them, other than they got flanked by other groups sick of Brady not doing good work. Put in a new team, and they could take off. Again. How the Teachers Union raises money in CA is have the Legislature put forward a bill demanding “Universal Pre-School” so if/when it passes all the Unemployed, economically illiterate, 3-yr. Teachur Skool grads can start funding the Union war-chest with their dues. I dunno. In terms of actual grassroots donations “old” Brady will be competing for the same “moderate” gun control dollars with the Gifford’s fresh, new PAC, (with its photogenic fresh new tragedy) which lacks Brady’s association with past legislative failures and “extreme for the current climate” ban supports. CSGV will leech off most of the crazies, Bloomy has his own angle, and OFA has theirs. Joyce and Hollywood dollars will likely follow the President’s OFA out of loyalty and for the same Brady irrelevance reasons you point out. Brady seems likely to be sucking hind teat for funding. And if the anti-rights groups can’t be made to coordinate their message they will be continuing the dissension and confusion among their already low-intensity backers that blew the more sophisticated groups “We’re only after ‘reasonable regulations'” claims this time. Whereas, as long as NRA continues the new “no compromise” position (and CCRKBA gets back in line) all the pro-rights groups will be more or less coherent in message and have a pretty good distribution of motivated supporters with less poaching. I think CCRKBA still needs some “Zumboing” for its stupidity. They need to be held accountable but now is not the time to start eating our own. As Heinlein would say, praise immediately and punish immediately. Out of the limelight, of course. I’m pretty sure the April 19 NRA-ILA money bomb at a major shooting forum I visit raised more funds than Brady has in the last decade. Sadly, these people will not just go away. NRA has won some serious cred. I am budgeting a few bucks every month for recurring NRA-ILA donations and looking at upgrading to life. We need to stay in this fight for the long haul and one easy way to do that is writing a regular check.